Click Play on the Podcast Player below to Listen to the Episode! 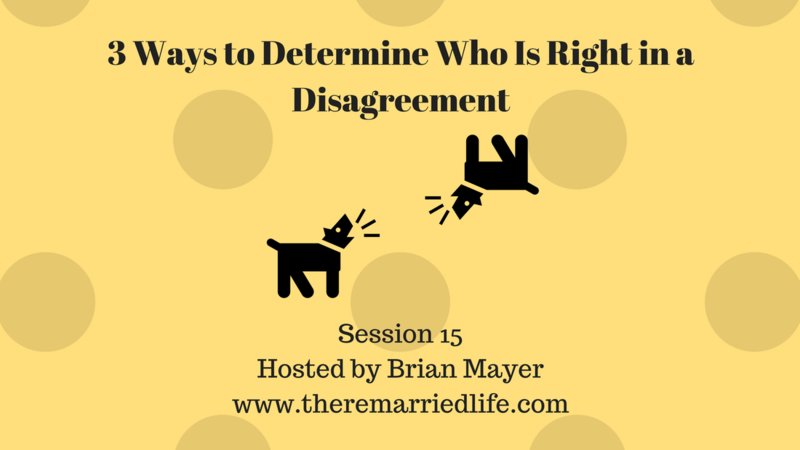 In my couples sessions, many enter wanting to present their case for their stance on an issue. Then one or both will often look directly at me and say who is right on this issue. Or one might say in your marriage how would that make you feel? This is a very complicated issue and cannot be answered easily. Now one caveat, when it comes to illegal activity like abuse or immoral activity like having an affair this is obviously more clear cut. However, what we will discuss in this episode is more the day to day issue. For example, I often hear couples talking about privacy of phones and computer and what is allowable, or maybe going to a party and one of you is extroverted while the other is introverted, or it could be how to juggle home and work life, or how best to parent children when it comes to discipline. So how do you know who is right and who is wrong? First, I want to talk about your World View. In other words how you view the world. Where did this come from? This started in childhood and was influenced by your parents, teachers, and other leaders in life. So for example, with me the political party that I more align with actually developed in me as early as 7-8 years old and was heavily influenced by my father and my grandparents. How we communicate in relationships also develops in childhood. I talk to many couples where one comes from a chaotic household where there is a lot of yelling to get a point across and the other partner comes from a more peaceful environment. This invariably causes issues in how the couple communicates and solves problems. Once we get in touch with the fact that something is driving and coloring our decision making, we must seek to understand our partner’s worldview. Exercise: On a sheet of paper make a grid by drawing 2 perpendicular lines. This will create 4 boxes. At thetop write the world write the word “Structure (Discipline, Boundaries)” and on the left write the word “Support (Closeness and Warmth).” The box on the top left will represent Low Structure, High Support. The box on the top right represents High Structure, High Support. The box on the lower left represents Low Structure, Low Support, and the box on the bottom right represents High Discipline, Low Support. Now give a lot of thought to your childhood when it came to rules, bedtimes, understanding your role and then couple that with how much you felt encouraged and supported by your parents and the family system. Then compare that with your partner’s experience. Have lots of rich conversation about this and be sure to stay discussing childhood until you have a significant understanding of your partner’s experience. Only then can you begin to discuss what is happening the present. Talk about how growing up has influenced what you do today. Secondly, think about what baggage you are bringing from the prior broken relationship. We often project what a past partner did into a current relationship. Again this is something that most of us are not even aware until we do a complete analysis of the prior relationship. You have heard it mentioned often here that there is something called doing an autopsy of your prior relationship. Think about your trigger points. Triggers are things done in the present that will often remind us of something that happened in the past. Many times there is no basis or connection or similarity. It’s just that our mind has made that connection. Discuss, Discuss, Discuss what each of you went through in a different relationship. Continue to reaffirm to each other that this is a new relationship and that you are different people. Do this often. Third and finally, how do we know who is right or wrong? In any issue, before getting to the answer we must both Listen and understand each other. Often we don’t have the full story or the full understanding of what the other person is saying. For example, my wife might make the statement “I don’t want to make dinner tonight.” If I don’t get more information, my mind could go in 1 of 100 different directions. I could think, “She must be mad at me then” or “She must want me to take her out tonight” or “She must be exhausted.” So without getting more information I have completely jumped to conclusion. So great after listening to all of this, you are probably thinking that I haven’t answered the question. This is because there may not actually be a good answer to this question. John Gottman well known couples and relationship researcher says there are 2 kinds of problems couples have. There are Solvable Problems and then there are Perpetual Problems. Solvable problems have a specific solution that can generally be agreed upon (easily if your relationship is in a good place or not so easily if not). An example of a solvable problem might be discussing the time to have dinner. Perpetual problems constitute 70% of the issues couples face. These problems result from things like different world views and different personalities. Perpetual problems can only be worked through with things like gaining understanding, compromising, giving a little etc. Speaking of personalities, I would encourage you and your partner to take a Myers Briggs type personality test. It tests you on 4 different components that create a total of 16 different personality types. Complete and discuss. The question of who is right and who is wrong is never easily answered. Above all treat each other with kindness and respect when discussing differences. Have fun knowing you are not exactly alike and these difference are what help you grow as a couple. With so many things that take time in our lives, I more grateful than you know that you took time to listen to this podcast episode. If you liked this episode and believe that it would be beneficial to a friend, family member, or colleague, please share it using the social media buttons on this page. The Remarried Life Facebook Group is a community of people just like you who get and give support. Please join today! Receive lots more free tips, advice, and information in the remarried and blended family journey! Yes, Brian Subscribe Me Today!